Tomorrow night the Yankees and Athletics will play the win or go home AL Wild Card Game at Yankee Stadium. We’ve been through this twice already — the Yankees lost to the Astros in the 2015 Wild Card Game and beat the Twins in the 2017 Wild Card Game — but that doesn’t make it any easier. The prospect of a 100-win season being washed away in one game is scary. With the game less than 36 hours away, we still don’t know who will start for either team. The Yankees have been mulling it over for weeks — my guess is it’ll be Luis Severino, but what do I know — and so have the Athletics, who have been hammered by rotation injuries and don’t have an obvious Wild Card Game starter. Because of that, the A’s are said to be ready to bullpen it. The alternative to a bullpen game would be Mike Fiers, who lines up to start tomorrow. He’s had a good season overall (3.56 ERA and 4.75 FIP) but is the kind of soft-tossing fly ball guy who gives up a lot of home runs and isn’t a good fit for Yankee Stadium at all. Fiers gave up 32 homers in 172 regular season innings and, last time out, he allowed six runs in 3.1 innings. Oakland could always surprise everyone and start Fiers with a short leash tomorrow. We’ll get a definitive answer to both team’s pitching plans later today during the workout at Yankee Stadium, but, for now, the most likely scenario seems to be a straight bullpen game with a parade of one and two-inning relievers. So, with that in mind, let’s break down the A’s bullpen and figure out who fits where. The Athletics have dabbled with an opener in recent weeks and Hendriks has gotten the call more often than anyone else. It’s not even close, really. Hendriks has made eight starts in recent weeks. Lou Trivino is the only other reliever to start as an opener. He’s made one start. If the A’s do go with an opener, all indications are it’ll be Hendriks. In his eight starts (opens? ), Hendriks has allowed two runs in 8.2 innings with a .224 wOBA against. He tossed a scoreless first inning in his first start, they sent him out for a second inning, he allowed two runs, and that was it. It’s been one and done since then. If he starts tomorrow, I imagine Hendriks will be one inning and done again. Hendriks is a mid-90s fastball/slider guy who has weirdly been better against lefties (.296 wOBA) than righties (.360 wOBA) not only this season, but the last few seasons as well. The split wasn’t always this drastic, but he has a clear reverse split. Huh. Maybe that makes the Andrew McCutchen-Aaron Judge one-two punch a good matchup against Hendriks?
? Disgusting. 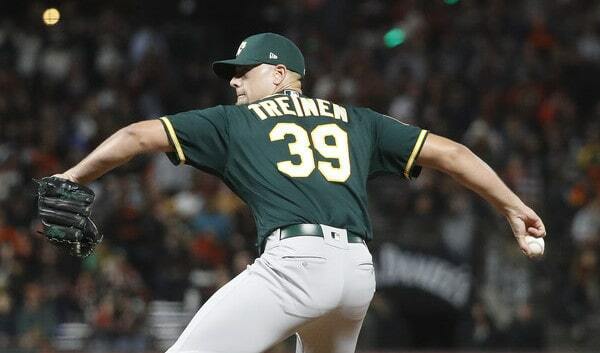 Treinen was an All-Star this year and he threw 80.1 innings with a 0.78 ERA (1.82 FIP) with 31.8% strikeouts and 51.9% grounders on the season overall. He doesn’t walk anyone either. Treinen had 6.7% walk rate this season. Goodness. The key number there: 80.1 innings. Treinen threw 80.1 innings in 68 appearances this year. Ten times he threw two full innings this season, including one three-inning appearance. On 19 occasions Treinen recorded at least four outs. Only 20 relievers had more appearances of four or more outs this season and three of them were Rays’ long men who followed an opener, so it’s really only 17 relievers. Point is, the Yankees are likely looking at a seven-inning game tomorrow night. Treinen has not pitched since Saturday, so he’ll go into the Wild Card Game with three days rest. I have to think Melvin and the A’s are planning on a two-inning save. If not planning on it then at least considering it. Treinen is out of this world good. If the Yankees are trailing after seven innings, they’re in serious trouble. Familia is a potential crack in the dam. As good as he was overall this year — Familia threw 72 innings with a 3.13 ERA (2.65 FIP) and 27.5% strikeouts in 2018 — Familia has struggled lately, allowing six runs in his last 8.2 innings and 12 runs in his last 21.2 innings. He loaded the bases with no outs in a game against the Yankees last month and walked in the tying run. Not many pitches in the zone these days. 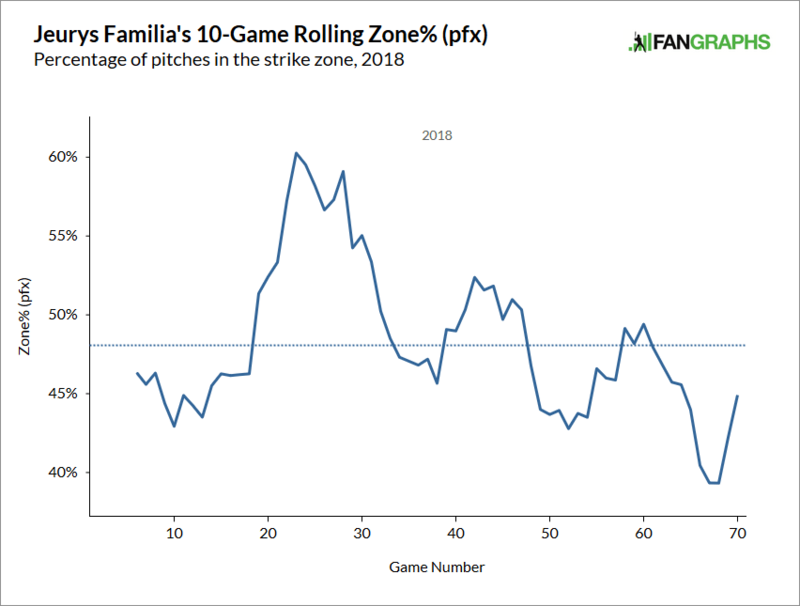 Familia throws an upper-90s sinker that moves all over the place as well as a slider and a splitter, and he’s had some control problems recently. Not 2017 Dellin Betances control problems, but control problems. Once he enters the game, we should be able to tell pretty quickly whether he’s locked in or not. And if he’s not, Familia will absolutely walk himself in trouble. That’s something that should be on the Yankees’ radar. Also, for what it’s worth, Familia has a penchant for back-breaking home runs in the postseason. He allowed a game-tying solo home run to Alex Gordon in the ninth inning of Game One of the 2015 World Series, and the game-winning three-run home run to Conor Gillaspie in the ninth inning of the 2016 Wild Card Game. If you’re a believer in “this guy can’t perform in the postseason,” that should make you feel better. The walks are the big thing to me. The A’s acquired Kelley from the Nationals in an August trade — remember when he was designated for assignment for being “unprofessional?” — and, in his 19 appearances with Oakland, he entered in the middle of an inning with men on base eight times. He’s the fireman. He inherited 19 runners in those eight appearances and three scored. We all remember Kelley from his time with the Yankees, right? He’s a fastball/slider pitcher (it’s basically a 50/50 split) who struck out 26.3% of batters faced this season, including 27.0% of right-handed batters for his career. The downside here? Lots of fly balls (30.2% grounders) and lots of homers (1.29 HR/9). Bring him in with men on base and you run the risk of a multi-run home run, especially at Yankee Stadium. That’s the A’s problem. As always, the preference is letting the reliever start an inning fresh. But, if the Athletics run into some trouble and need someone to pitch them out of a jam, especially with right-handed hitters do up, Kelley figures to be the guy Melvin calls on. He’s going to get swings and misses. Always has. But he’ll also let hitters elevate the ball. Kelley is one of those “he’ll make mistakes, so don’t miss it” guys. In all seriousness, Rodney deserves major props for slinging mid-90s fastballs and posting a 3.36 ERA (4.03 FIP) in 64.1 innings at age 41. May all your favorite players have that kind of longevity. Anyway, Rodney is very much a wild card, and I mean that with no pun intended. He could come in and strike out the side or he could come in, walk two batters, hit another, and give up four runs. We’ve seen him give up some pretty big home runs to the Yankees this year. Rodney gave up the walk-off home run to Gary Sanchez when he was with the Twins and Luke Voit hit a go-ahead home run against him in Oakland last month. Melvin has used Rodney as sort of his jack of all trades reliever. Treinen is the closer and Familia is the main setup guy. Rodney has pitched the seventh inning mostly, and also the eighth when Familia or Treinen weren’t available. I’m not sure how much Melvin really trusts him. Enough to use him in a winner-take-all game? When the A’s were trying to chase down the Astros in the AL West, Rodney didn’t see many close games. I don’t know where Rodney fits in the pecking order tomorrow. Melvin may try to avoid him all together or he may trust him enough to use him in a one-run game in the sixth or seventh inning. No matter when he pitches, Rodney’s effectiveness kinda depends on which side of the bed he wakes up on. He’s very unpredictable and a patient team like the Yankees can take advantage of his wildness. A Lou Trivino if I ever saw one. Opponents have hit .295/.382/.513 against Trivino in his last 24 games and 19.2 innings — for reference, that is more or less 2018 Paul Goldschmidt (.290/.389/.533) — and he finished the regular season having allowed seven runs in his final four appearances and 2.2 innings. Yikes. For all intents and purposes, Trivino is the A’s version of 2017 Dellin Betances. Their struggles are different — Betances walked everyone last year while Trivino is simply getting hit hard this year — but the idea is the same. They were a trusted setup man pretty much all year who has become persona non grata come postseason time. Emergencies only. Trivino is a four-seamer/two-seamer/cutter guy whose location has suffered and may’ve become a little too predictable this year. His recent ineffectiveness has really put some pressure on Familia and Rodney (and Kelley). The whole idea was to build a four-headed bullpen monster at the end of games. Trivino hasn’t held up his end of the bargain. Melvin has spent the last few weeks trying to get Trivino right — the A’s were sitting comfortably in postseason position and they let him work through things — and it hasn’t really happened. The postseason is not the time to let a player try to right the ship. If they go with a bullpen game, Trivino may be used out of necessity. He is definitely a weak link right now. There is damage potential here. Left-on-left specialists are a dying breed but Buchter is one of the few true matchup guys remaining. Case in point: He threw 39.1 innings in 54 appearances this season. That’s a LOOGYs workload. Buchter held lefties to a .165/.231/.265 (.222 wOBA) batting line with 31.5% strikeouts this year. Righties? They hit .286/.366/.476 (.360 wOBA) with 16.9% strikeouts against him. Buchter will be on the Wild Card Game roster for one reason and one reason only: Didi Gregorius. I suppose he could turn Aaron Hicks around to his weaker side of the plate (weaker side this year, anyway), but it seems more likely Buchter and his fastball/curveball combo will be used against Gregorius. That’s the best left-on-left matchup for the Athletics now that Brett Gardner and Greg Bird have given way to McCutchen and Voit, respectively. If there’s one thing to like about the Buchter-Gregorius matchup, it is the potential for a fly ball. Buchter has a 25.2% ground ball rate this year. It’s a slightly better 30.2% ground ball rate against lefties. Gregorius, over the last three seasons, has a 39.6% ground ball rate and a 36.8% pull rate against southpaws. He knows how to hit the ball toward the short porch. Buchter is very fly ball prone and that might play right to Didi’s strength. 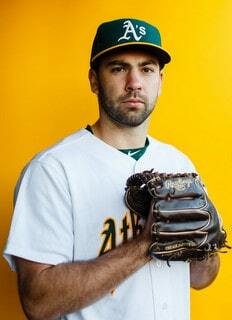 Wendelken is the A’s version of Stephen Tarpley. He’s a righty, not a lefty, but he pitched his way into postseason roster consideration with a strong September. It’s not even a consideration. Slusser says Wendelken’s on the roster. He allowed one run in 16.2 innings this year, including eight scoreless innings in September. The good news: Wendelken is not a big strikeout pitcher (22.6%). The bad news: Wendelken gets a lot of weak fly balls and popups. Those frustrate me to no end. He’s a mid-90 fastball/curveball/changeup guy, so this isn’t a full blown Marco Estrada “OMG why aren’t they hitting these 86 mph fastballs?? ?” profile, but it’s the same idea. He leaves hitters flummoxed.
? With Trivino struggling and Rodney so unpredictable, I suspect Wendelken will be counted on quite a bit in the Wild Card Game. He might be the first guy out of the bullpen following the opener and he might be asked to throw two innings, possibly even three if his pitch count is low. No one on the Yankees has faced Wendelken. The entire roster will be going in blind. Not great! I can hear Brian Johnson on the TBS broadcast now. “And what a job by J.B. Wendelken to shut the Yankees down here. He wasn’t on the radar at all before coming out of nowhere in September.” I don’t like it. The potential to get Wendelkened is too high for my liking. With any luck, Wendelken’s general lack of whiffs and 10.0% minor league walk rate will manifest themselves at the wrong time against the wrong lineup in the wrong ballpark. The Yankees’ lineup can be unforgiving. They’ve never seen Wendelken before, but Wendelken’s never seen the Yankees or Yankee Stadium in the postseason. It can be intimidating. Petit does it all, man. He can throw two or three innings at a time or face one batter in a matchup spot. He’s sorta like 2009 Alfredo Aceves. Aceves could do whatever. Petit has a 3.00 ERA (3.93 FIP) with 20.7% strikeouts and the kind of ground ball (35.8%) and home run (1.26 HR/9) rates that don’t normally play well in Yankee Stadium. He is in Melvin’s Circle of Trust™ though, and if the A’s bullpen the Wild Card Game, they’ll need Petit at some point. That is potentially nine pitchers for nine innings. The Athletics are expected to carry eleven pitchers on the Wild Card Game roster — Jane Lee says they’ll have a starter for extra innings and low-leverage righty Emilio Pagan on the roster — and, clearly, those middle innings are crucial. Familia has been shaky lately. I still don’t want the A’s handing him and Treinen a lead. The common thread here is fly balls. Fly balls and home runs. Even with Treinen’s hellacious sinker and Familia’s merely very good sinker, Oakland’s bullpen posted the second lowest ground ball rate (40.6%) in baseball and a 1.05 HR/9 rate that would’ve been much higher in a different home ballpark. Kelley, Buchter, and Petit will all give up fly balls and Wendelken has done the same in his brief MLB career. For the Yankees, there is undoubtedly a disadvantage to never seeing one pitcher multiple times in a game. That’s the entire point of the bullpenning/opener strategy. Limit the number of times the hitter sees a pitcher. The Yankees have seen their fair share of bullpen games this season thanks to the Rays, and we know they can be annoyingly effective. The A’s are doing it out of necessity. The downside of a bullpen game is that you’re using so many relievers, and the more relievers you use, the more likely it is you run into someone who just doesn’t have it that day. The Yankees effectively bullpenned the Wild Card Game last year, but they used four relievers in 8.2 innings. Using seven or eight relievers to cover nine innings is a different animal. It’s doable. For sure. The A’s wouldn’t do this if they were confident in any of their starters though. This is the best of several not great options.